I still remember my first computer, a 386 with a whopping 40-megabyte hard drive, and the thrill when my family booted up our very first game, King’s Quest V. I had discovered a new obsession. Computer games became my currency: 3.5 disks traded with friends, hard-earned dollars spent at Best Buy and budget games under the Christmas tree. I explored the coasts of Britannia in Ultima VI, trying in vain to make my way back to the pirate den I had stumbled across once before. My notebooks overflowed with graphs as I delved further and further into the dungeons of Skara Brae. And, like most other players of the time, I worked my way through the entire Sierra catalog and waited in desperate anticipation for the announcement of each new game. Gaming was an integral part of my life, and I revisited my favorites nearly every year. 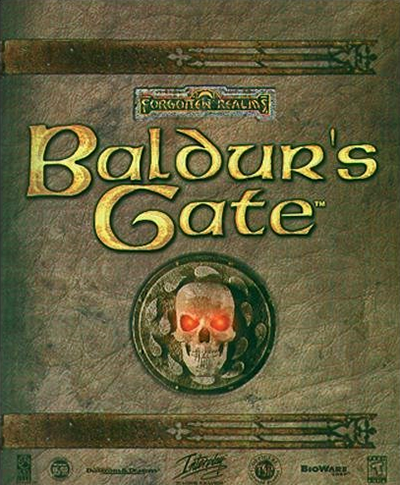 Having played through the entire Gold Box series and read dozens of Forgotten Realms novels, I was giddy when I heard that a new game, Baldur’s Gate, would be released in 1998. Booting it up the same day it was released, I created my character, stepped into Candlekeep and…felt thoroughly disappointed. Unrealistic expectations? A different style of gaming perhaps? Whatever the reason, it took several days before I truly began to the love the game. It went downhill from there. Baldur’s Gate II, Torment, Icewind Dale. I couldn’t get enough of the Infinity Engine, and have yet to find a series of games that can provide such a wonderful combination of action, emotion and story-telling. From that love sprang the hobby of making custom portraits for Baldur’s Gate. While I now play far fewer games than in the past, every once in a while I revisit my childhood obsession. Dragon Age, Skyrim and a few others still draw out those same feelings of wonder, an emotion that I think far too few of us retain in the modern world. Despite my love of fantasy and gaming, I ended up in a profession far detached from them. After completing my undergraduate degree in English, I went on to earn two master’s degrees in education and business. Having moved to Asia in 2005, I now work as an administrator in international education, and spend much of my free time working on projects such as this site. You can sometimes connect with me on the Baldur’s Gate Forums. A: I don’t want to tell you. If you’re resourceful, you could find out on your own. Q: Where in Asia do you live? A: Tall, dark and handsome. Or I hope at least one of them. Q: ur piX totally roCk n u shud wurk for EA or somthin!!! A: Thank you for the compliment. Learn to write. Q: I’ve seen some of your other work on sites. Why isn’t it here? A: It’s one of two things: work I did based on requests, or something I remade or intend to remake. Q: Will you make a portrait for me if I send you a picture? A: It’s unlikely as of 2015 given my schedule, but that may change at some point. Q: Are you available to do work on modifications? A: Yes. In addition the creation of portraits, I am a published writer (in professional publications), and am willing to create characters and items, collaborate in scripting, and edit existing material.